I picked up this book because I loved Westerfeld’s Uglies series, but So Yesterday left me a little disappointed. It started out fast-paced and intriguing, but it died down near the end…or middle. Lots of reviewers on Amazon.com have this same critique. But still, it’s an interesting reflection on what is “cool” and “fashionable” in society. There’s also the perfect amount of teen romance as told through the perspective of awkward teen, Hunter. Jen, Hunter’s crush, is really the mastermind behind this story, which isn’t surprising given Westerfeld’s abilities to write pretty bomb female characters. I also didn’t love this book because I didn’t identify with the rich, fashion-obsessed characters. Yes, they reflected critically on fashion and society, but, man, I got tired of reading about shoes and roller skates. I’m not so sure my future students will relate to these characters either who are all white and rich with white, rich friends who go to crazy parties with other rich, white people. Perhaps I’m being too critical, but it’s really dripping with upper class-ness. The reading level is middle-school level and nothing too difficult. 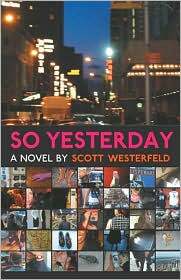 There were some interesting vocabulary used as Westerfeld does so well. At any rate, So Yesterday makes you think, which is never bad.